A few years ago I was sitting in a café with an old friend casually chatting and catching up on each other’s lives. This friend of mine brought up a recent article she had read online about an actor. She exclaimed that Macaulay Culkin had passed away. My brows furrowed as I shook my head in disbelief. I pulled out my phone and searched the whereabouts of the actor. He was alive and well. That was the first time I had witnessed an individual being tricked by false news right before my eyes. 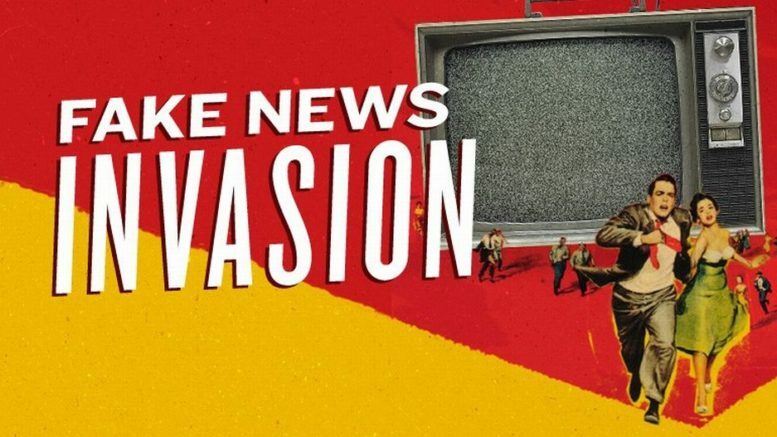 False news can have several long lasting negative impacts however it can have positive effects by proving to be a savvy method to garner attention. False news has become a growing issue that has escalated with the introduction of the World Wide Web. Information can be spread at lighting speed with a simple click. Once false news has spread across the globe one must undo the tangled web of misinformation and spread the correct news which unfortunately may not reach everyone. People may remain in the dark about many issues. One can investigate such a case found in China where model claims that the internet ruined her career. Heidi Yeh was told that she would be modeling for a company whose advertisement would only appear in a newspaper. The advertisement featured a family of five posing for a family portrait. The advertisement was for a plastic surgery clinic and it was captioned “the only thing you’ll have to worry about is how to explain it to the kids”. The model states that the children’s faces have been photoshopped. However, people began to spread the fake story that the man playing the husband in the advertisement found out that his wife had gotten plastic surgery which explains why the kids do not look like them. Heidi Yeh did not foresee herself becoming an internet entertainment when taking on the job. The advertisement extended to every corner of the online web as people from all over the world began discussing the model claiming she had modified her features. Heidi’s modeling career took a dive as many began to doubt her. She was then only offered small scale modelling jobs. Heidi Yeh’s case is an unfortunate event; a frightening realization of the consequences of false news. False news has the power to tarnish an image and cause someone’s career to be negatively affected. Social media platforms acting as immediate sources of news can have severe negative effects. Fox news tweet about framing the Toronto mosque massacre on an innocent Moroccan Muslim man caused an outburst of racism and self-righteous attitudes from Trump supporters claiming “I told you so”. These unfortunate situations lead to witch hunting innocent people. Thousands of North Americans use social media platforms such as Facebook, Twitter, and Instagram as a source of news, this can prove to be highly unfavourable because it allows easy access and global transportation of false news. An infamous case involving the spread of false news over social media is the controversy surrounding Mr. Hugh Mungus. Rudy Pantoja was being interviewed by a news station until he ran into Zarna Joshi, who happened to be protesting against the police during the time. Joshi approached Pantoja and asked his name. Pantoja responded in a playful manner claiming his name was Hugh Mungus. What was meant to be a simple joke quickly spiraled out of control as Joshi began accusing Pantoja of sexually harassing her. The taped altercation was uploaded by Joshi and a witch hunt began. Pantoja was attacked online, thousands began labelling Pantoja as a misogynist. As the misunderstanding continued to brew Pantoja put a stop to it through an interview. In the interview he explained that calling himself Hugh Mungus was a joke he had made about his weight. Pantoja further explained that he was thanking the police for getting his heroin addicting daughter off the streets. While clearing his name during the interview he asked the audience to donate to a charity called Hope Soldiers that supports women with substance use/and or mental health disorders. Fortunately, in this case justice quickly prevailed. The accusations against Rudy Pantoja were quelled and he gained many supporters. The team who is known to use false news to their advantage are The Yes Men; a clever duo that work together to dupe greedy corporations exposing their criminal acts against humanity. In the documentary ‘The Yes Men Fix the World’, Andy Bichlbaum and Mike Bonanno impersonate top officials from DOW Chemicals and they land themselves a live interview with BBC news. Bichlbaum states on live television that DOW chemicals will clean up India’s toxic Bhopal plant and compensate the victims of the disaster. DOW’s stock quickly declined and they issued a statement explaining that it was false news that they had been impersonated. This tactic shed light on shameful and inhumane acts of large corporations. The public should not be put into a position where they must question the validity of news. False news is malicious because it can cause the real news to be ridiculed. In order to expose fake news one should always make sure to check the source. It is important to check which site has posted the news because it may be from an unknown news source with zero credibility. When fake news is being spread about a case one should wait until investigations have been made into the allegation. One should consider waiting for the full story to be officially released to the public before formulating a complete opinion to share on the web. With these steps you can help minimize the circulation of false news. Be the first to comment on "The Shock Waves of False News: Three Life Changing Cases"